Before I continue my so-called New York Fashion Week “reviews”, I just want to tell you, my dearies, that the holidays are approaching like a bullet train. Malls have started playing Christmas songs through their speakers and as I made my way through every store, I couldn’t help but think of gold and green as well as the presents (I will receive) wrapped in chic papers. Uh-oh, it seems like I have to start saving up for a holiday shopping spree. Hey, it wouldn’t hurt a thing if I get myself a few pieces to overhaul my closet. Anyway, I think I have to take inspiration from these fabulous collections off the runways of the NYFW Spring/Summer 2014. Nautical elegance is how I should describe Badgley Mischka’s summer collection. It’s almost safe to say that blue and white are the important shades to pay attention to next year. If Alexander Wang was able to pull off that 90s vibe, Mark Badgley and James Mischka took a trip back to the 20s for their inspiration. While there were tweed and airy skirts, the label didn’t fail to impress with their red carpet-worthy gowns that I can’t wait to see on Hollywood celebrities. This particular silver tube gown would definitely look great on my love Anne Hathaway. And oh, I should get at least one cloche hat as my summer must-have accessory. 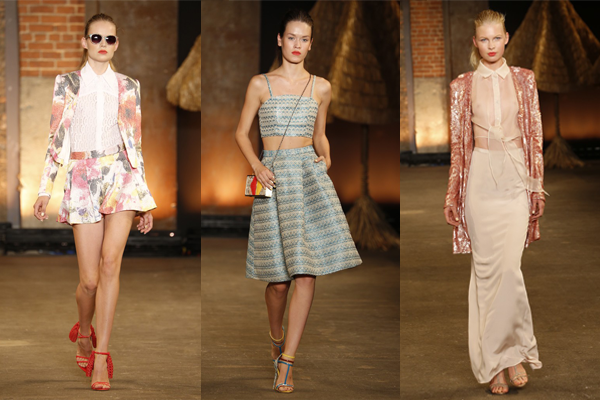 One of my favorite American designers, Christian Siriano, reminded me that summer is, after all, about having fun under the sun. Just like crop tops, prints are here to stay and I don’t think nothing can stop them from ruling the fashion industry soon. Siriano sprinkled a dash of whimsicality to the modernity of his collection. Not all fashion mavens can work it that way, but the Project Runway alum nailed it. Of all the looks presented on the catwalk, it’s the baby pink sheer blouse, silk skirt, and sequined cardigan that took my breath away. Who wouldn’t want to stand out in the crowd wearing that? The only babe I can think of donning that combo is Kate Bosworth. 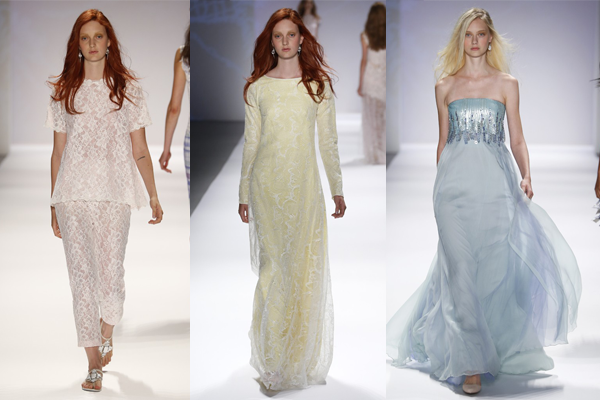 Tadashi Shoji brought pastels back to life after he showed his summer collection that’s bursting with mint green, pale yellow, and the oh-so-spring lavender. The soft fabrics weren’t the only star of the night for lace has also made a fashionable comeback on the runway. While I’m not a big fan of the ladylike lace, I’d like to give it a shot as long as I’m at the office and not somewhere heavily polluted. Teehee! If I may add, I fell in love with the tube baby blue gown that I suddenly thought of Elle or Dakota Fanning on it. Agree? Oh, I just can’t wait to welcome summer with my arms open wide. excellnt issues altogether, you simply won a neew reader. What might you recommend in regarrds to your pput up that you just made somke days ago? Some really nice and useful info on this internet site, too I believe the design has superb features. I’ve been browsing online greater than three hours today, yet I by no means found any attention-grabbing article like yours. It’s beautiful value sufficient for me. Personally, if all webmasters and bloggers made just right content as you did, the internet might be a lot more useful than ever before. “Baseball is 90 percent mental. The other half is physical.” by Lawrence Peter Berra. Extremely useful information specially the last part 🙂 I take care of such information much. Temporary as they are, at least you can get some peace and quiet for a while. help and advices, making sure that you only use and administer the medication your doctor prescribed. as a tight blood vessel or muscle. Another good garage group thought is to make a listing checklist of what’s in the storage and where it’s in the garage. The deficiency in vitamins often leads to slim. to make sure that everyone looks their best. Improve yourself not only personally but physically as well. Alpaca fiber comes in more than 52 natural colors as classified in Peru. in Mississippi (video) Funny lady Betty White appears on Saturday Night Live (SNL video). clothes can never look expensive, even if it truly is. over reactions outdoors of meditation. HWR is one particular way to calculate every single one’s perfect waist size.